Chris Webb puts the Lonmin massacre in some historical perspective. On August 4, 1946 over one thousand miners assembled in Market Square in Johannesburg, South Africa. No hall in the town was big enough to hold them, and no one would have rented one to them anyway. The miners were members of the African Mine Worker's Union (AMWU), a non-European union which was formed five years earlier in order to address the 12 to 1 pay differential between white and black mineworkers. The gathering carried forward just one unanimous resolution: African miners would demand a minimum wage of ten shillings (about 1 Rand) per day. If the Transvaal Chamber of Mines did not meet this demand, all African mine workers would embark on a general strike immediately. Workers mounted the platform one after the other to testify: "When I think of how we left our homes in the reserves, our children naked and starving, we have nothing more to say. Every man must agree to strike on 12 August. It is better to die than go back with empty hands." The progressive Guardian newspaper reported an old miner getting to his feet and addressing his comrades: "We on the mines are dead men already!" 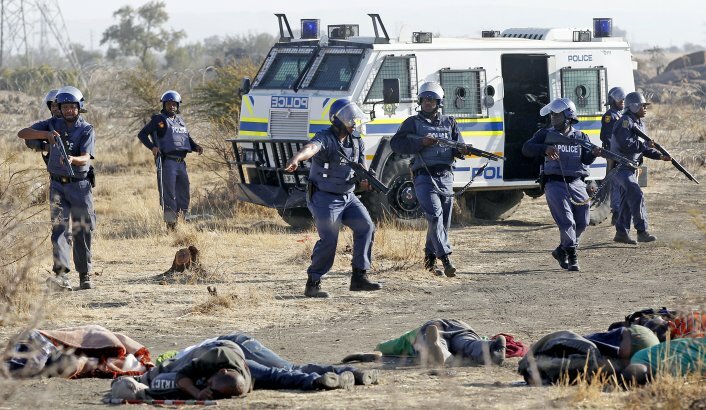 The massacre of 45 people, including 34 miners, at Marikana in the North West province is an inevitable outcome of a system of production and exploitation that has historically treated human life as cheap and disposable. If there is a central core – a stem in relation to which so many other events are branches – that runs through South African history, it is the demand for cheap labour for South Africa's mines. "There is no industry of the size and prosperity of this that has managed its cheap labour policy so successfully," wrote Ruth First in reference to the Chamber of Mines ability to pressure the government for policies that displaced Africans from their land and put them under the boot of mining bosses. Mechanisms such as poll and hut taxes, pass laws, Masters and Servants Acts and grinding rural poverty were all integral in ensuring a cheap and uninterrupted supply of labour for the mines. Pass laws were created in order to forge a society in which farm work or mining was the only viable employment options for the black population. And yet the low wages and dangerous work conditions kept many within the country away, forcing the Chamber of Mines to recruit labour from as far afield as Malawi and China throughout the nineteenth and twentieth centuries. Sordid deals between Portuguese East Africa and Apartheid South Africa ensured forced labour to be recruited for the mines and by 1929 there were 115,000 Mozambicans working underground. "It has been said," wrote First in her study of migrant Mozambican miners, "that the wealth of Reef gold mines lies not in the richness of the strike but in the low costs of production kept down by cheap labour." When AMWU was formed in 1941 black miners earned 70 Rand a year while white workers received 848 Rand. White miners had been organized for many years, but there was little solidarity between the two groups as evidenced by the 1922 Rand Rebellion led by the whites-only Mine Workers Union. White miners went on strike against management's attempt at weakening the colour bar in order to facilitate the entry of cheaper black labour into skilled positions. Supported by the Communist Party of South Africa under the banner of "Unite and Fight for a White South Africa!" the rebellion was viciously crushed by the state leaving over 200 dead. The growth of non-European unions in the 1940s was dramatic and for the very first time the interests of African mineworkers were on the table. Their demands threatened the very foundations of the cheap labour system, and so in 1944 Prime Minister Jan Smuts tabled the War Measure 1425 preventing a gathering of 20 or more on mine property. Despite these difficulties the union pressed on and in 1946 they approached the Chamber of Mines with their demand for wage increases. A letter calling for last minute negotiations with the Chamber of Mines was, as usual, ignored. By August 12th tens-of-thousands of black miners were on strike from the East to the West Rand. The state showed the utmost brutality, chasing workers down mineshafts with live ammunition and cracking down on potential sympathy strikes in the city of Johannesburg. By August 16th the state had bludgeoned 100,000 miners back to work and nine lay dead. Throughout the four-day strike hundreds of trade union leaders were arrested, with the central committee of the Communist Party and local ANC leaders arrested and tried for treason and sedition. The violence came on the cusp of the 1948 elections, which would see further repression and the beginning of the country's anti-communist hysteria. While it did not succeed in its immediate aims, the strike was a watershed moment in South African politics and would forever change the consciousness of the labour movement. Thirty years late Monty Naicker, one of the leading figures in the South African Indian Congress, argued that the strike "transformed African politics overnight. It spelt the end of the compromising, concession-begging tendencies that dominated African politics. The timid opportunism and begging for favours disappeared." The Native Representative Council, formed by the state in 1937 to address the age old 'native question,' disbanded on August 15th and ANC president Dr. A.B. Xuma reiterated the demand for "recognition of African trade unions and adequate wages for African workers including mineworkers." The 1946 mineworkers strike was the spark that ignited the anti-apartheid movement. The ANC Youth League's 1949 Program of Action owes much to the militancy of these workers as does the Defiance Campaign of the 1950s and the emergence of the ANC's armed wing Umkhonto we Sizwe (Spear of the Nation) in the 1960s. It is too early to say what sort of impact the current Lonmin strike will have on South African politics, but it seems unlikely that it will be as transformative as those of the past. The National Union of Mineworkers (NUM), arguably the heirs to the 1946 strike are currently engaged in a series of territorial disputes with the breakaway Association of Mineworkers and Construction Union (AMCU). Meanwhile COSATU's muted response has echoed the ANC's line of equal-culpability and half-mast public mourning. The increasingly incoherent South African Communist Party has called for the arrest of AMCU leaders with some of its so-called cadres defending the police action. Former ANC Youth League leader Julius Malema's plea for miners to hold the line and form a more militant union reek of political opportunism. "A proliferation of shacks and informal settlements, the rapid deterioration of formal infra-structure and housing in Marikana itself, and the fact that a section of the township constructed by Lonmin did not have electricity for more than a month during the time of our last visit. At the RDP Township we found broken down drainage systems spilling directly into the river at three different points." In fact, the study predicted further violent protests at Marikana in the coming year. The mass dismissal of 9000 workers in May last year inflamed already tense relations between the community and the mine as dismissed workers lost their homes in the company's housing scheme. Once again, these facts are hardly new in the world of South African mining. Behind the squalid settlements that surround the mineshafts there are immense profits to be made. In recent years the platinum mining industry has prospered like no other thanks to the increased popularity of platinum jewellery and the use of the metal in vehicle exhaust systems in the United State and European countries. Production increased by 60 per cent between 1980 and 1994, while the price soared almost fivefold. The value of sales, almost all exported, thus increased to almost 12 per cent of total sales by the mining industry. The price rose so dramatically throughout the 1990s that it is on par with gold as the country's leading mineral export. South Africa's platinum industry is the largest in the world and in 2011 reported total revenues of $13.3-billion, which is expected to increase by 15.8% over the next five years. Lonmin itself is one of the largest producers of platinum in the world, and the bulk of its tonnage comes from the Marikana mine. The company recorded revenues of $1.9-billion in 2011, an increase of 25.7%, the majority of which would come from the Marikana shafts. 1. Monty Naicker, "The African Miners Strike of 1946," 1976. 2. Ruth First, "The Gold of Migrant Labour," Spearhead, 1962. 3. Ruth First, "The Gold of Migrant Labour," Spearhead, 1962. 4. Monty Naicker, "The African Miners Strike of 1946," 1976. 5. Dr. A.B. Xuma quoted in Monty Naicker, "The African Miners Strike of 1946." 6. The Bench Marks Foundation, "Communities in the Platinum Minefields," 2012. 7. The Bench Marks Foundation, "Communities in the Platinum Minefields," 2012. 9. Marketline Advantage Reports on South Africa's Platinum Group Metals, 2011.